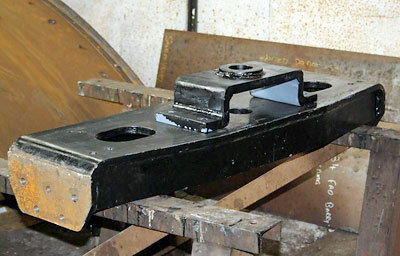 The two fabricated frame stretcher/pony truck pivot centre supports are being machined in Sheffield as are the cast hornblocks and horn guides. The two radial arm support stretchers which we have been working on intermittently for some time are now awaiting the fitted bolts, currently being manufactured before final boring of the kingpin hole can take place. 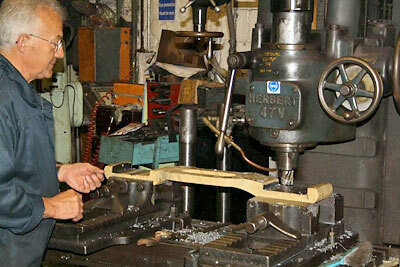 In the meantime Richard Fraser is machining the six frame keeps, also known as horn stays or horn ties. Peter Line has done sterling work on preparing a radius edge on the frames preparatory to fitting the hornblocks and axle box guides. He is now preparing a specification for the rivetting aspect of the frame structure. Brian Oldford has now produced the patterns for the expansion link brackets. These have been moved to storage pending casting in due course. Trust member Neil Cocksedge has devised a ten-round quiz on all aspects of railways to raise funds for wheeling 82045. The quiz, in the form of a booklet, costs just £2-00 to enter and the six highest scorers (the quiz is tough but you don't have to get full marks!) will each win a footplate ride with Tony and Chris over the SVR. First prize will be a one-way fooplate trip over the full length of the Railway, while the five runners-up will each win a trip over one section of the SVR: Kidderminster-Bewdley, Bewdley-Arley, Arley-Highley, Highley-Hampton Loade or Hampton Loade-Bridgnorth. Closing date is March 31st 2011 and scripts will be marked by Neil. To get your copy, send a cheque for £2-40 (to include postage) to: 82045 Quiz, 28 Woodthorpe Drive, Bewdley DY12 2RH. The weather conspired to ruin our outing at the SVR Autumn Gala. Friday was a battle against driving rain and a bitterly cold northerly wind which did its upmost to blow our gazebo from Bridgnorth to Kidderminster! The day was abandoned and we arranged to spend Saturday and Sunday in the cosy machine shop where we did a very brisk trade. Many members and supporters donated tombola gifts and railway items for our sales stand and we are most grateful to everyone for helping to make the event a success for us. Thank you one and all! Regular Monday Gang member Richard Fraser keeps a skilled eye on the machining of one of the six horn ties for 82045 cast earlier this year. 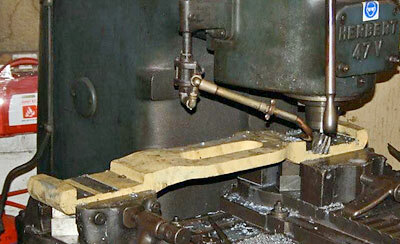 Machining frame keep/horn tie on the Herbert milling machine.